Jan. 15 (Bloomberg) -- Crude oil fell for a fifth day, its longest losing streak in a month, as the dollar gained against the euro, curbing demand for commodities as a currency hedge. Oil is heading for its first weekly decline in five weeks after a U.S. government report showed crude stockpiles rose for a second straight week. The International Energy Agency kept its forecast for 2010 global crude demand unchanged at 86.3 million barrels a day in a monthly report today. Crude oil for February delivery fell as much as 82 cents, or 1 percent, to $78.57 a barrel in electronic trading on the New York Mercantile Exchange, and traded at $78.80 at 1:46 p.m. London time. A close at that level would mean a drop of 4.8 percent this week. The dollar gained the most in almost a month against the euro as Greece’s struggles with its budget deficit dented confidence in the region. The dollar traded as high as $1.4359 against the euro. Oil settled below $80 a barrel on Jan. 13, the first time this year, after the U.S. Energy Department said crude, gasoline and distillate increased. Crude oil stockpiles climbed for a second week, adding 3.7 million barrels to 331 million barrels, the Energy Department said Jan. 13. The IEA cut its forecast for oil supplies from outside OPEC this year because of lower-than-expected production in Azerbaijan. Supplies from outside OPEC will climb by 200,000 barrels a day next near compared with 2009. Production from Azerbaijan’s Azeri-Chirag-Guneshli field was cut by a gas leak in 2008. Brent crude for March settlement fell as much as 93 cents, or 1.2 percent, to $77.64 a barrel on the London-based ICE Futures Europe exchange. It was at $77.82 at 1:45 p.m. London time. Jan. 15 (Bloomberg) -- Gold prices fell as the dollar’s rally sapped investor demand for the metal as an alternative asset. Palladium jumped to an 18-month high. The greenback gained as much as 0.8 percent against a basket of six major currencies, halting a five-session slide. Demand for the dollar as a haven increased amid speculation that China’s economy will cool following central bank steps to tighten credit. Gold has climbed 40 percent in 12 months as the dollar declined 8.5 percent. “It’s the dollar move driving prices,” said Afshin Nabavi, a senior vice president at MKS Finance SA, a bullion refiner in Geneva. Gold futures for February delivery fell $12.50, or 1.1 percent, to $1,130.50 an ounce on the Comex division of the New York Mercantile Exchange, capping a 0.7 percent decline this week. The metal tumbled 7.3 percent last month after reaching a record $1,227.50 on Dec. 3. Bullion held by the SPDR Gold Trust, the biggest exchange- traded fund backed by the metal, fell 2.13 metric tons to 1,113.75 tons as of yesterday. Gold may gain next week as investors seek an alternative to the dollar, a Bloomberg News survey showed. Of 19 traders, investors and analysts surveyed, 12, or 63 percent, said the metal would rise. Five forecast a decline and two were neutral. Among other precious metals, silver futures for March delivery fell 22.8 cents, or 1.2 percent, to $18.427 an ounce in New York. For the week, the metal slipped 0.2 percent. Platinum for April delivery fell $8.70, or 0.5 percent, to $1,596.10 an ounce. The price gained 1.6 percent this week. Palladium futures for March delivery rose $4.70, or 1.1 percent, to $447.75 an ounce. Earlier, the most-active contract reached $454, the highest price since July 15, 2008. The metal climbed 5.3 percent this week. The ETFS Platinum Trust and ETFS Palladium Trust started trading in New York on Jan. 8, offering shares backed by metal. The ETFs may deepen shortages in global supplies, analysts said. “Platinum and palladium should continue to respond to inflows of investment to the new ETFs,” said Tom Pawlicki, an MF Global Ltd. analyst in Chicago. Jan. 15 (Bloomberg) -- The yen and dollar rose against most of their major counterparts as stocks dropped and investors questioned the strength of the global economic recovery, discouraging demand for higher-yielding assets. The euro fell the most in almost a month versus the dollar as Greece’s struggle to cut its budget deficit reduced investor confidence in European assets. Australia’s dollar and Norway’s krone dropped as concern China’s banks are reducing property loans slowed demand for the nations’ raw materials. The yen advanced 1.2 percent to 130.61 per euro at 5:08 p.m. in New York, from 132.25 yesterday, after reaching 130.31, the strongest level since Dec. 22. The euro dropped 0.8 percent to $1.4387, from $1.4499. It slid as much as 1.1 percent, the biggest intraday loss since Dec. 17. The 16-nation currency will fall to $1.40 by the end of March, according to Gullberg. The dollar decreased 0.5 percent to 90.77 yen, from 91.21. It touched 90.60, the lowest level since Dec. 21. New Zealand’s currency fell 1.1 percent to 66.99 yen and the Brazilian real slid 0.7 percent to 1.7723 per dollar on speculation investors will reduce carry trades, in which they buy higher-yielding assets with amounts borrowed in nations with low interest rates. The benchmarks of 0.1 percent in Japan and zero to 0.25 percent in the U.S. have made the yen and dollar popular for funding such transactions. China’s banks are only interested in making loans for residential developments, the Guangzhou-based 21st Century Business Herald said on its Web site. The banks aren’t extending loans for luxury homes and commercial developments, said the newspaper, citing unidentified commercial bank officials. The People’s Bank of China unexpectedly said this week it will increase the proportion of deposits the nation’s lenders must set aside as reserves in an effort to rein in growth. The Standard & Poor’s 500 Index fell 1.1 percent today on the economic and business outlook. Australia’s currency fell 1.0 percent to 92.28 U.S. cents and the krone depreciated 0.9 percent to 5.6803 per dollar as the price of raw materials fell. Commodities account for more than half of Australia’s overseas shipments, while crude oil is Norway’s biggest export. The dollar posted a second weekly loss against the yen, dropping 2 percent as traders added to bets the Federal Reserve will keep interest rates at almost zero to revive growth. U.S. consumer prices rose 0.1 percent in December after a 0.4 percent advance in the previous month, the Labor Department reported today. The median forecast of 77 economists in a Bloomberg News survey was for a 0.2 percent increase. The Reuters/University of Michigan preliminary index of consumer sentiment increased this month to 72.8, from 72.5 in December. The median forecast of 68 economists in a Bloomberg survey was for a reading of 74. Futures on the CME Group exchange show a 27 percent chance the Fed will raise its target lending rate by at least a quarter-percentage point by its June meeting, down from almost 55 percent odds a month ago. The euro recorded a 2.2 percent weekly decline against the yen after German Chancellor Angela Merkel said on Jan. 13 that Greece’s mounting budget deficit risks hurting the euro, adding the currency faces a “very difficult” phase. European Central Bank President Jean-Claude Trichet said yesterday individual members of the currency region can’t expect special treatment. Jan. 15 (Bloomberg) -- Crude oil fell, poised for the first weekly decline in five, after rising U.S. jobless claims and weaker retail sales dented confidence in the strength of the economic recovery. Oil has fallen for a fifth day as sales at retailers slipped 0.3 percent in December after a 1.8 percent gain in November, according to the Commerce Department in Washington. Weekly jobless claims in the U.S., the world’s largest oil- consuming nation, climbed 2.5 percent, the most in five weeks, the Labor Department said. Crude oil for February delivery fell as much as 47 cents, or 0.6 percent, to $78.92 a barrel in electronic trading on the New York Mercantile Exchange, and traded at $78.98 at 9:08 a.m. Singapore time. Yesterday, the contract fell 26 cents to $79.39. Futures are poised for a decline of 4.6 percent this week, the first since the week ending Dec. 11. Jan. 15 (Bloomberg) -- The dollar headed for a second weekly decline against the euro and the yen on speculation the Federal Reserve will keep interest rates near zero to aid the U.S. economic recovery. The greenback was poised for a loss this week against 14 of the 16 major currencies before a U.S. report that economists said will show industrial production climbed at a slower pace last month and after the Commerce Department yesterday said retail sales unexpectedly contracted. Australia’s dollar was near a two-month high versus the U.S. currency as traders this week boosted bets the central bank will increase interest rates. The dollar traded at 91.28 yen as of 9:01 a.m. in Tokyo from 91.21 yen in New York yesterday, heading for 1.5 percent loss this week. The U.S. currency was at $1.4500 per euro from $1.449 yesterday, having slid 0.6 percent in the past five days. The yen was at 132.27 per euro from 132.25 yesterday. U.S. factory output rose 0.6 percent in December after gaining 0.8 percent in November, according to a Bloomberg News survey before today’s report. Retail sales fell 0.3 percent in December, the Commerce Department said yesterday. The median forecast of economists surveyed by Bloomberg was for a 0.5 percent increase. Fed officials debated at the Dec. 15-16 meeting increasing and extending their stimulus program should the economy weaken, according to minutes of the meeting released Jan. 6. A few favored such a move while one discussed a reduction. Australia’s dollar headed for a third weekly gain versus the greenback on speculation the Reserve Bank will raise its benchmark rate at its next meeting on Feb. 2 after a report yesterday showed the nation added jobs for a fourth month. The RBA’s key rate of 3.75 percent compares with 0.1 percent in Japan and as low as zero in the U.S., making Australian assets relatively more attractive. Traders boosted bets the RBA will increase rates at its next meeting to 71 percent today, from 62 percent odds at the end of last week, according to an index compiled by Credit Suisse Group AG. Australia’s currency was at 93.06 U.S. cents from 93.18 cents yesterday, when it touched an eight-week high of 93.28. The so-called Aussie has strengthened 0.7 percent this week. CPO 3rd month Mac futures contract traded RM20 points higher as compare to previous trading sessions to close at RM2530 with a total of 13,429 lots traded in the market. CPO price manage to trade higher during trading sessions as crude oil and soybean oil were trade firm during overnight and electronic trading. 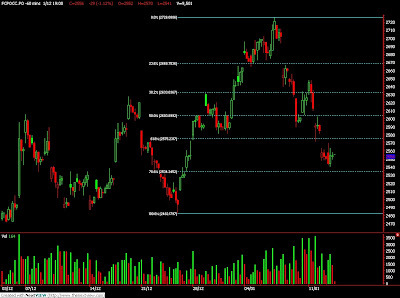 CPO price manage to retrace 50% Fibonacci support levels at RM2505 regions after traded higher since open for trading in the morning sessions. CPO hourly price chart shows another significant increase of volume on the 2nd lower bottom due to attempt the test support at RM2500 regions. Technically, CPO price would resume on bull trend with condition that support levels at RM2494 and RM2482 were not violated during the trading sessions. However, CPO price would expect to encounter some selling pressure around resistance levels at RM2585 and RM2611 regions. FKLI Jan Futures contract traded 5.5 point higher to settle at 1297 levels as compare to previous trading session to with a total of 4,805 lots traded in the market. FKLI was traded higher during trading sessions but traded lower before end of closing due to Hang Seng Indices were traded lower as profit taking activity. FKLI was resisted around resistance levels at 1300 regions after 5th attempts to overrule it despite manage to penetrate previous resistance levels at 1293.5 and 1298.5 regions. FKLI was manage to retrace 38.1% Fibonacci support levels at 1295.5 regions during trading sessions before manage to close at 1297. Technically, FKLI seems counting on wave 5 upwards provided support levels at 1293.5 and 1289.5 were strictly not violated during trading sessions. However, FKLI would expect to encounter some selling pressure around resistance levels at 1300.5 and 1313.5; both were 23.6% and 50% Fibonacci resistance levels. Jan. 14 (Bloomberg) -- Oil traded below $80 a barrel in New York after declining as a government report showed that supplies of crude and fuels increased as demand dropped in the U.S., the world’s biggest energy consumer. Oil fell 1.4 percent yesterday after the Energy Department said crude inventories rose last week by more than twice as much as the median of analyst forecasts in a Bloomberg News survey. Supplies of distillate fuels, including heating oil and diesel, gained in contrast with estimates that they would drop. Crude oil for February delivery was unchanged at $79.65 a barrel in electronic trading on the New York Mercantile Exchange at 10:29 a.m. Sydney time. Yesterday, the contract fell $1.14 to $79.65, the lowest settlement since Dec. 31. Distillate fuel inventories increased by 1.35 million barrels to 160.4 million, the department said in Washington yesterday. That compares with the drop of 1.3 million barrels expected by 18 analysts surveyed by Bloomberg. Supplies were forecast to decline as record-cold weather in the U.S. last week boosted heating-fuel demand. Oil supplies rose by 3.7 million barrels last week to 331 million. Inventories were forecast to rise by 1.5 million barrels. Fuel demand averaged over the past four weeks decreased 0.9 percent. Oil has dropped 3.7 percent in the past four days, the longest decline in more than four weeks. China, the world’s fastest-growing major economy and second-biggest oil consumer, raised bank reserve requirements for the first time since 2008 to curb a credit boom and prevent the economy from overheating. Oil also fell after a government report showed the German economy probably stagnated in the fourth quarter of 2009, capping the worst year for Europe’s largest economy since World War II, according to the Federal Statistics Office. U.K. manufacturing unexpectedly stalled for a second month in November, a sign the economy is struggling to shake off the longest recession on record, the Office for National Statistics reported yesterday in London. Brent crude for February settlement fell 99 cents, or 1.2 percent, to $78.31 a barrel on the London-based ICE Futures Europe exchange yesterday, its fifth consecutive decline. The February contract expires today. Jan. 13 (Bloomberg) -- Gold rose for the third time in four sessions on speculation that the Federal Reserve will hold U.S. lending rates low for an extended period, eroding the value of the dollar. The greenback dropped as much as 0.5 percent against a basket of six major currencies. Gold rose 24 percent last year as the central bank kept rates at close to zero percent to spur the economy, helping send the dollar down 4.2 percent. “If the Fed foolishly keeps interest rates too low for too long, money is going to flow into gold and commodities,” said Leonard Kaplan, the president of Prospector Asset Management in Evanston, Illinois. Gold futures for February delivery rose $7.40, or 0.7 percent, to $1,136.80 an ounce on the Comex division of the New York Mercantile Exchange. Prices climbed as much as 0.8 percent and dropped as much as 1 percent. The metal may top $1,200 in the first half of the year on demand for a hedge against inflation, said Philip Klapwijk, the chairman of London-based researcher GFMS Ltd. In 2009, gold rallied for the ninth straight year, reaching an all-time high of $1,227.50 on Dec. 3. Gold imports by India, the world’s biggest buyer, fell 18 percent to 343 metric tons last year as record prices curbed demand from jewelers and housewives, the Bombay Bullion Association Ltd. said today. Silver futures for March delivery rose 29.5 cents, or 1.6 percent, to $18.55 an ounce in New York. The metal is up 74 percent in the past 12 months. Platinum futures for April delivery fell $4.20, or 0.3 percent, to $1,574.40 an ounce. Palladium for March delivery dropped 85 cents, or 0.2 percent, to $424.95 an ounce. Platinum will average $1,525 this year, 16 percent above an earlier estimate, Morgan Stanley said today in a report. Palladium will average $372, 44 percent higher than a previous projection, the bank said. Jan. 13 (Bloomberg) -- Soybeans jumped the most in more than two weeks on speculation that food and animal-feed makers stepped up purchases after prices slid to a two-month low. Demand for soybeans for feed and cooking oils increased after the price fell 7.8 percent in the past five sessions, said Mario Balletto, a CitiGroup Global Markets Inc. grain analyst in Chicago. The potential profit from crushing the oilseed rose 6.5 percent this week to 78 cents a bushel, data from the Chicago Board of Trade show. “You are seeing some increase in demand from both overseas and domestic consumers after the recent break in prices,” Balletto said. Soybean futures for March delivery rose 14.5 cents, or 1.5 percent, to $9.925 a bushel on the Chicago Board of Trade, the biggest gain since Dec. 28. Yesterday, the most-active contract touched $9.69, the lowest price since Nov. 12. Today’s gain halted a five-session slump, the longest slide since early September. Soybeans climbed 13 percent in the fourth quarter on record Chinese purchases of U.S. supplies. Export sales and shipments from Sept. 1 through Dec. 31 jumped 55 percent from a year earlier to a record 32.265 million metric tons for the date, USDA data show. Animal-feed exports and purchases since Oct. 1 surged 87 percent to 5.83 million tons by Dec. 31, compared with a year earlier, while cooking-oil demand more than tripled, government figures show. Soybean-meal futures for March delivery rose $5.70, or 2 percent, to $291.50 per 2,000 pounds in Chicago. Yesterday, the most-active contract touched $284.10, the lowest price since Nov. 10. March soybean oil gained 0.38 cent, or 1 percent, to 39.01 cents a pound. The U.S. soybean harvest was valued at a record $27.4 billion in 2008, the nation’s largest crop after corn, government figures show. Jan. 14 (Bloomberg) -- The dollar may extend losses versus higher-yielding currencies on speculation the Federal Reserve will keep interest rates low to sustain an economic recovery. The euro traded near a one-month high against the dollar before a report today forecast to show European industrial output gained in November. Australia’s dollar was close to the strongest level in more than seven weeks as economists estimated government figures today will show employers added jobs in December for a fourth month. The dollar traded at $1.4509 per euro at 8:11 a.m. in Tokyo from $1.4510 in New York yesterday, when it touched $1.4579, the lowest since Dec. 16. The dollar fetched 91.42 yen from 91.37 yen. The yen was at 132.63 per euro from 132.59. Futures trading in Chicago yesterday showed a 34 percent chance that the Fed will raise its target lending rate by at least a quarter-percentage point by its June meeting, down from about 41 percent odds a week ago. Fed’s Chicago President Charles Evans said the central bank’s pledge to hold the main interest rate near zero for an “extended period” implies no change for three to four meetings of policy makers. The Fed’s summary of current economic conditions, known as the Beige Book, said the economy improved in 10 of the central bank’s 12 districts last month. The report released yesterday is used as a basis of discussion at policy meetings, which typically follow two weeks later. The Federal Open Market Committee gathers on Jan. 27. The euro may advance as industrial production in the economy of the 16 nations using the euro probably rose 0.5 percent in November after dropping 0.6 percent in October, according to the median estimate of economists in a Bloomberg News survey. The European Union’s statistics office in Luxembourg is set to report the data today. The Australian dollar was at 92.38 U.S. cents from 92.42 yesterday. Employers in the nation probably added 10,000 jobs last month, after creating 31,200 positions in November, according to the median estimate of 19 economists in a Bloomberg News survey. The data are due at 11:30 a.m. today in Sydney. The currency touched 93.26 cents on Jan. 11, the highest since Nov. 18. CPO 3rd month Mac futures contract traded RM46 points lower as compare to previous trading sessions to close at RM2510 with a total of 12,392 lots traded in the market. CPO price continue to plunge lower for 5th consecutive trading days as soybean oil and crude oil were plunge lower during overnight and electronic trading. CPO price recovered mild after manage to meet support levels at RM2482 regions; 100% and 123.6% Fibonacci support levels, with significant spike up in traded volume; highest amount since last 5 trading days. Technically, CPO price is possible to count as complete wave 2 in the hourly chart at RM2481 levels only with condition support levels at RM2482 must not be violated during trading sessions. 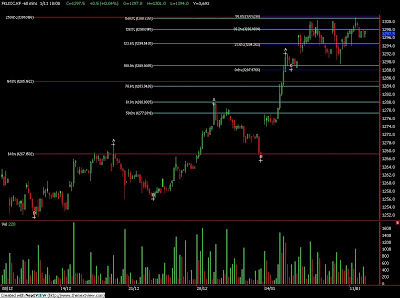 Breach of support levels at RM2482 shall indicate alternative count where next support levels seen at RM2427 regions. However, CPO price would indicate further buying signal if resistance levels at RM2590 and RM2647 were violated in the coming trading sessions. FKLI Jan Futures contract closed marginally 1.5 point lower to settle at 1291.5 levels as compare to previous trading session to with a total of 4,500 lots traded in the market. FKLI was traded sideways since opening sessions for trading despite regional indices especially Nikkei Exchange, Hang Seng exchange and Shang Hai Exchange plunge lower during trading sessions. FKLI traded sideways within range from 1289.5 to 1292 regions hence form rectangular consolidation in the hourly price chart. FKLI seems holding above support levels at 1290; 23.6% and 100% Fibonacci support levels while hourly RSI seem temporary supported above the trend line. Technically, FKLI must not trade above resistance levels at 1293.5 and 1298.5 in order for FKLI to remain trading within tight range in the hourly price chart. Further selling activity would initiate if support levels at 1290 and 1278.5; both 23.6% and 50% Fibonacci support levels, fails to hold against the selling pressure. Jan. 13 (Bloomberg) -- Oil declined for a third a day after China raised bank reserve requirements to curb a credit boom and prevent the economy from overheating, and as an industry report showed an increase in U.S. crude and distillate stockpiles. Oil fell 2.1 percent yesterday as China, the second-largest energy consuming nation, increased the proportion of deposits banks must set aside for the first time since 2008. Supplies of distillate fuel, a category that includes heating oil and diesel, rose 3.6 million barrels last week, a report from the American Petroleum Institute showed yesterday. U.S. stocks fell after Alcoa Inc.’s earnings trailed estimates. Crude oil for February delivery dropped 58 cents, or 0.7 percent, to $80.21 a barrel in electronic trading on the New York Mercantile Exchange at 11:17 a.m. Sydney time. Yesterday, the contract fell $1.73 to settle at $80.79, the biggest one-day decline since Dec. 9. China’s move will help remove about 300 billion yuan ($44 billion) of liquidity from the Chinese economy, according to estimates by Xing Ziqiang, an economist in Beijing at China International Capital Corp., ranked the top China local brokerage by Asiamoney magazine last year. Inventories of crude oil in the U.S., the biggest energy consumer, increased 1.2 million barrels last week to 330.1 million, yesterday’s API report showed. The U.S. government is forecast to report a 1.5 million-barrel increase in crude oil supplies from 327.3 million barrels last week, according to a Bloomberg News survey of analysts before the release of Energy Department figures today. U.S. distillate fuel stockpiles reported by the department are forecast to decline for a fifth week as demand increased during the cold snap, according to the Bloomberg News survey. Supplies probably dropped 1.3 million barrels last week, based on the median estimate from 18 analysts in the survey. The Energy Department will release its Weekly Petroleum Status Report at 10:30 a.m. in Washington. Oil also declined yesterday amid predictions for above- average temperatures in eastern cities including New York and Boston this week. The Northeast accounts for four-fifths of U.S. heating oil consumption. The National Weather Service is predicting temperatures in New York City will increase to 44 degrees Fahrenheit (7 Celsius) by Jan. 15 from sub-freezing levels earlier in the week. U.S. stocks fell yesterday, with the Standard & Poor’s 500 Index retreating for the first time this year. Alcoa, the first Dow Jones Industrial Average company to report fourth-quarter earnings, tumbled 11 percent in its biggest drop since March. Electronic Arts Inc. plummeted 7.8 percent after the video-game publisher reported preliminary results that fell short of analysts’ estimates. Brent crude oil for February settlement dropped $1.67, or 2.1 percent, to $79.30 a barrel on the London-based ICE Futures Europe exchange yesterday, declining for a fourth day. CPO 3rd month Mac futures contract traded RM29 points lower as compare to previous trading sessions to close at RM2556 with a total of 9,501 lots traded in the market. CPO price sideways after open lower in the morning sessions due to weak soybean oil overnight and electronic trading. 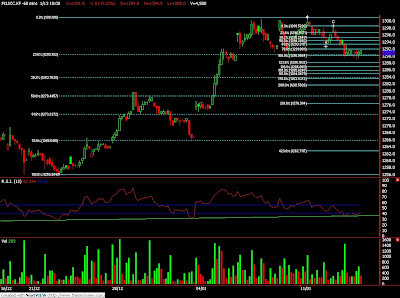 CPO price consolidate within range from RM2550 to RM2565 regions after gap down lower from previous trading sessions. CPO price seems temporary supported above 78.6% Fibonacci support levels at RM2535 regions after manage to meet 78.6% Fibonacci projection figure at RM2541 regions. Technically, CPO price would reverse to medium term uptrend provided support levels at RM2538 and RM2482 were holding well against the selling pressure in the coming trading sessions. However, further selling pressure would occur if support level fails to hold. 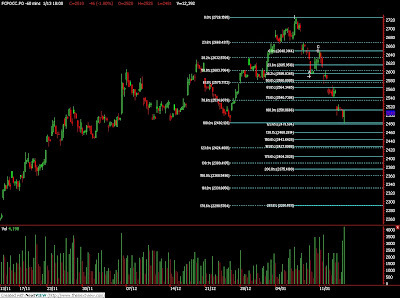 Resistance levels were seen at RM2600 and RM2650 regions. FKLI Jan Futures contract closed 3.5 point lower to settle at 1294 levels as compare to previous trading session to with a total of 2,733 lots traded in the market. FKLI was traded volatile search for high and low during trading session as regional indices and Dow Jones futures electronic trading were traded wild due to mix market sentiment. 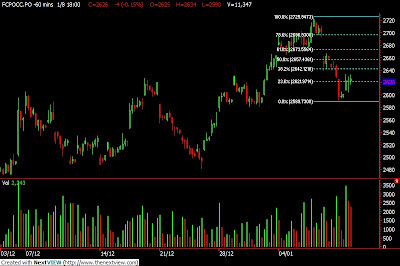 FKLI traded lower after manage to rebound 78.6% Fibonacci resistance levels at 1298 regions during trading sessions. Technically, FKLI seems traded sideways within range from 1300 to 1290 regions after 5 consecutive trading days for last 1 week trading sessions. However, FKLI must trade above resistance levels at 1303 and 1312.5; both were 261.8% and 161.8% Fibonacci resistance levels, in order for FKLI to retain Bullish sentiment back into market. 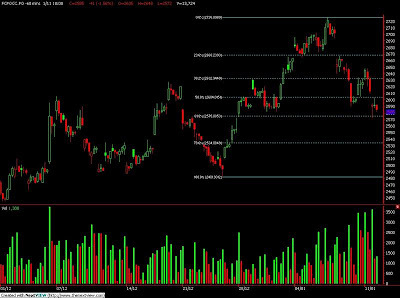 Support levels at 1290 and 1278; both were 23.6% and 50% Fibonacci support levels, were seen critical in order for FKLI bull trend to remain intact. Jan. 12 (Bloomberg) -- Crude oil dropped for a second day in New York on forecasts that cold weather in the eastern U.S. will abate this week, curbing demand for heating fuel. Oil declined after a prediction that above-normal temperatures will begin moving into eastern cities such as New York and Boston later this week, according to MDA Federal Inc.’s EarthSat Energy Weather. The Northeast is responsible for about four-fifths of U.S. heating oil use. Crude oil for February delivery dropped as much as 53 cents, or 0.6 percent, to $81.99 a barrel in electronic trading on the New York Mercantile Exchange. The contract was at $82.13 at 8:33 a.m. Singapore time. Yesterday, futures fell 23 cents, or 0.3 percent, to $82.52 a barrel. Earlier yesterday, oil touched $83.95, the highest level since Oct. 14, 2008, on a report that China, the world’s second- largest energy-consuming country, boosted crude purchases to a record last year and as the dollar fell against the euro. The average temperature in New York was 27 degrees Fahrenheit (minus 3 Celsius) during the first 10 days of 2010, according to the National Weather Service. That’s six degrees below normal. U.S. inventories of distillates probably fell 1 million barrels last week from 159 million because of demand during the cold snap, a Bloomberg survey of 11 analysts showed before the Energy Department’s supply report this week. Nine respondents forecast a decline and two estimated a gain. Oil supplies probably increased 1.5 million barrels last week from 327.3 million barrels during the five days ended Jan. 1, according to the Bloomberg News inventory survey. The Energy Department is scheduled to release its weekly report at 10:30 a.m. tomorrow in Washington. The dollar posted its biggest drop yesterday against the euro since November on speculation that the Federal Reserve will extend stimulus measures after a report showed last week that employers unexpectedly cut jobs in December. Factory payrolls declined 27,000 in December after decreasing 35,000 in the prior month, the U.S. Labor Department reported on Jan. 8. The dollar traded at $1.4494 per euro at 11:24 a.m. Sydney time, from $1.4513 yesterday. Brent crude oil for February settlement dropped 40 cents, or 0.5 percent, to $80.97 a barrel on the London-based ICE Futures Europe exchange yesterday. Jan. 11 (Bloomberg) -- Gold rose to a one-month high in New York and London as a weaker dollar increased demand for the precious metal as an alternative investment. Platinum climbed to the highest price in 17 months. The dollar fell the most against the euro since November, on speculation that the Federal Reserve will keep borrowing costs low for an extended period to revive growth. Gold rose 24 percent last year as the Fed kept interest rates near zero percent, sending the dollar down 4.2 percent against a basket of six major currencies. “In an environment of low interest rates and recovering global growth, we expect precious metals to continue their upward trend this year,” Walter de Wet, a Standard Bank Ltd. analyst in London, said today in a report. Gold futures for February delivery rose $12.50, or 1.1 percent, to $1,151.40 an ounce on the New York Mercantile Exchange’s Comex unit, the highest settlement price since Dec. 7. In London, gold for immediate delivery advanced $13.45, or 1.2 percent, to $1,151.70 an ounce at 8:24 p.m. local time. Odds that the Fed will boost its target rate for overnight loans between banks in June or August decreased over the past month after employers unexpectedly eliminated jobs in December, according to futures data compiled by Bloomberg. The dollar fell as much as 1 percent against the euro. “The technical breakout in the euro brought more buying into gold,” said Frank McGhee, the head dealer at Integrated Brokerage Services LLC in Chicago. The benchmark U.S. interest rate was cut to between zero percent and 0.25 percent in December 2008. Central banks in Australia, Norway and Israel increased borrowing costs in recent weeks. “Interest from investors has certainly been coming as a result of a declining dollar,” said Toby Hassall, a CWA Global Markets Pty commodity analyst in Sydney. Among other precious metals, silver futures for March delivery rose 22.5 cents, or 1.2 percent, to $18.695 an ounce in New York. Platinum for April delivery gained $21.90, or 1.4 percent, to $1,592.50 an ounce, the highest closing price since Aug. 6, 2008. Palladium for March delivery increased $6.80, or 1.6 percent, to $431.95 an ounce. Jan. 12 (Bloomberg) -- The dollar traded near a three-week low against the euro on speculation the Federal Reserve will maintain its policy of keeping interest rates low to spur a recovery in the world’s largest economy. Australia’s currency was near the strongest in seven weeks against the greenback before a government report that economists said will show employers in the nation added jobs in December for a fourth month. The dollar has weakened versus 15 of the 16 major currencies this year as futures traders cut bets the Fed will raise borrowing costs by its June meeting on signs the U.S. labor market remains weak. The dollar was at $1.4488 per euro as of 9:36 a.m. in Tokyo from $1.4513 in New York yesterday, when it declined to $1.4557, the weakest level since Dec. 16. The U.S. currency traded at 92.21 yen from 92.09. The euro bought 133.62 yen from 133.64 yen. Futures on the Chicago Board of Trade showed a 32 percent chance the U.S. central bank will raise its target rate for overnight bank loans by at least a quarter-percentage point by June, down from 51 percent odds a week earlier. U.S. initial jobless claims rose to 435,000 in the week ended Jan. 9 from 434,000 the prior week, according to the median estimate of economists in a Bloomberg News survey before the Labor Department’s Jan. 14 report. U.S. companies cut 85,000 jobs in December after a revised addition of 4,000 positions in the previous month, the Labor Department said on Jan. 8. The median estimate of economists in a Bloomberg survey was for no change. The euro advanced against the dollar yesterday on speculation investors will increase carry trades, in which they buy higher-yielding assets with amounts borrowed in nations with low interest rates. The U.S. benchmark rate of zero to 0.25 percent has made the dollar popular for funding such transactions. The European Central Bank’s main refinancing rate is 1 percent. The Australian dollar traded near the highest against since September 2008 against the yen before the statistics bureau releases its employment report on Jan. 14. The number of people employed in Australia rose 10,000 in December after gaining 31,200 in November, according to the median estimate of economists in a Bloomberg news. Australia’s dollar traded at 92.85 U.S. cents from 92.96 cents in New York yesterday, when it touched 93.26 cents, its highest since Nov. 18. The currency was at 85.55 yen from 85.60 yesterday, when it climbed to 86.21, the strongest since Sept. 29, 2008. New Zealand’s dollar was at 73.97 U.S. cents from 74.14 cents. It bought 68.29 yen from 68.28 yen. Japan’s current-account surplus widened to 1.1 trillion yen ($11.9 billion) in November from a year earlier, the Finance Ministry reported today in Tokyo. Economists surveyed by Bloomberg News forecast for 1 trillion yen. CPO 3rd month Mac futures contract traded RM41 points lower as compare to previous trading sessions to close at RM2585 with a total of 13,724 lots traded in the market. CPO price plunge lower after mild rebounds due to news release on CPO MPOB figure which favorable towards bearish direction. CPO price plunge lower after manage to rebound 38.1% Fibonacci resistance levels at RM2641 regions before plunge lower towards 61.8% Fibonacci support levels at RM2575 regions. 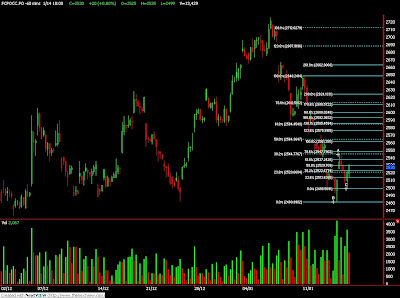 Technically, CPO price seems temporary bottomed provided support levels at RM2575 and RM2543; both were 61.8% and 78.6% Fibonacci support levels, were not violated in the coming trading sessions. However, CPO price would only indicate further buying interest if CPO price manage to penetrate above resistance levels at RM2650 and RM2700 regions. FKLI Dec Futures contract closed marginally 0.5 point higher to settle at 1297.5 levels as compare to previous trading session to with a total of 3,693 lots traded in the market. FKLI was traded sideways after manage to test higher at 1301 regions as regional indices and Dow Jones electronic trading were traded higher during trading sessions. 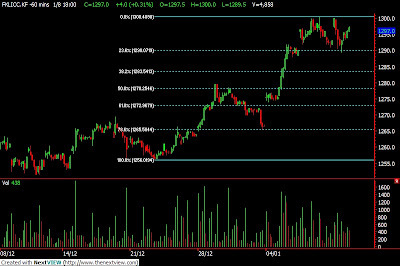 FKLI traded lower after manage to reach final wave count at 1301 regions; triple complete at 250%, 150% and 50% Fibonacci resistance levels, before starts to consolidate within range from 1296 to1298 regions throughout the entire trading sessions after fail to penetrate 1300 resistance level for 4th attempt. Technically, FKLI remain participate together recent bull rally provided FKLI manage to hold above resistance levels at 1304 and 1312 regions; both were 161.8% and 200% Fibonacci resistance levels. 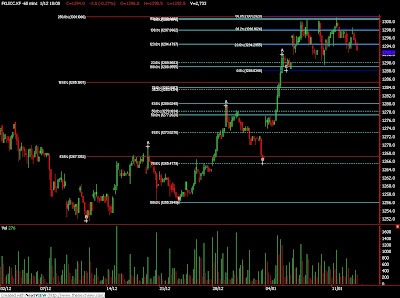 Support levels were seen level at 1293.5 and 1289.5 regions. Jan. 11 (Bloomberg) -- Crude oil rose for a second day on speculation increasing demand and constraints on supply will reduce global stockpiles and support prices. Oil imports by China, the world’s second-largest consumer, climbed 24 percent in December to reach a record annual total of 203.8 million metric tons, according to a customs report yesterday. Chevron Corp. said the Makaraba-Utonana pipeline it operates in southern Nigeria’s Delta state was breached on Jan. 8, shutting-in 20,000 barrels a day of crude. Crude oil for February delivery rose as much as 71 cents, or 0.9 percent, to $83.46 a barrel in after-hours electronic trading on the New York Mercantile Exchange. It was at $83.43 at 8:07 a.m. Singapore time. The contract rose 9 cents to $82.75 on Jan. 8 after the dollar tumbled on a report showing employment in the U.S. unexpectedly fell in December. Futures climbed 4.3 percent last week and gained in 11 of the past 12 sessions as freezing temperatures in Europe and North America boosted heating demand. The cold snap “has done its part in eating away at the distillates stockpiles, but really it’s the industrial demand that the market is going to be focusing on,” Hassall said. “We’ve still got an ample supply cushion” and that will limit the pace of any price gains from here, he said. U.S. crude oil stockpiles rose for the first time in five weeks in the period ended Jan. 1, and are 0.5 percent higher than the same time a year ago, according to Energy Department data. Distillate supplies, including heating oil and diesel, fell for a fourth week and were 8.9 percent higher than a year earlier. Brent crude oil for February settlement rose 52 cents, or 0.6 percent, to $81.89 a barrel on the London-based ICE Futures Europe exchange. It fell 0.2 percent to $81.37 on Jan. 8. The dollar slid as much as 0.5 percent to $1.4479 per euro in early Asian trading, from $1.4409 in New York on Jan. 8, and last traded at $1.4470. A weaker dollar improves the investment appeal of commodities priced in the currency. New York oil futures climbed 78 percent last year as the sliding U.S. dollar steered investors toward commodities and production restraint by the Organization of Petroleum Exporting Countries helped stem rising stockpiles as demand improved. Closer quota compliance by OPEC member states will be needed to maintain recent price gains amid forecast weak first- half demand, Iran’s OPEC Governor Mohammad Ali Khatibi told the state-run Fars news agency on Jan. 8. Hedge-fund managers and other large speculators increased bets on rising oil prices for three straight weeks, according to U.S. Commodity Futures Trading Commission data. Speculative net-long positions, the difference between orders to buy and sell the commodity, climbed 16 percent to 108,835 contracts on the New York Mercantile Exchange in the week ending Jan. 5, the commission said in its weekly report. Jan. 11 (Bloomberg) -- The dollar fell to a three-week low against the euro and slid to the weakest since October versus its Canadian counterpart as signs the global recovery is gaining pace boosted demand for higher-yielding and commodity currencies. The U.S. currency declined to its lowest level in a month versus the Australian dollar after a Chinese government report yesterday showed exports climbed for the first time in 14 months and imports reached record highs. The yen traded near a one- month low against the euro on speculation the Japanese government will maintain pressure on the central bank to take more policy measures to revive economic growth. The dollar dropped to $1.4488 per euro as of 9:45 a.m. in Tokyo from $1.4409 yesterday in New York, after declining to $1.4495, the weakest since Dec. 17. The greenback slid to C$1.0272 from C$1.0298, after touching C$1.0266, the lowest since Oct. 15. The greenback slipped to 92.30 yen from 92.66 yen. The yen was at 133.53 per euro from 134.46. Australia’s dollar rose to 93.06 U.S. cents from 92.48 cents, after earlier reaching 93.13 cents, the highest since Dec. 3. New Zealand’s dollar advanced to 73.98 cents from 73.66 cents. Commodity currencies strengthened after China’s customs bureau said on its Web site yesterday that exports climbed 17.7 percent from a year earlier and imports jumped 55.9 percent in December. Year-on-year comparisons are affected by declines from late 2008 when the global credit crisis deepened. The Dollar Index, which the ICE futures exchange uses to track the greenback against currencies of six major U.S. trading partners including the euro, declined 0.5 percent today. The index has fallen 14 percent from its March peak as evidence of a global economic rebound prompted investors to buy higher- yielding assets funded with dollars. FKLI Dec Futures contract traded 4 points higher to settle at 1297 levels as compare to previous trading session to with a total of 4,858 lots traded in the market. 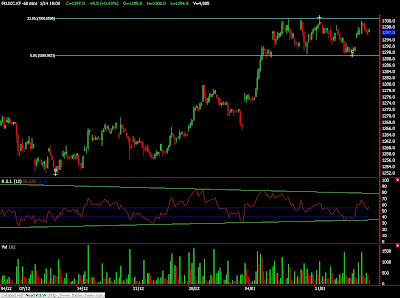 FKLI look for short term support and traded lower during morning sessions while surge higher in the 2nd trading session due to firm regional indices and Dow Jones futures electronic trading. FKLI encounter great buying interest around 23.6% Fibonacci support levels at 1290 regions and manage to rebound 78.6% Fibonacci resistance levels at 1297.5 regions after 1300 psychology resistance level were tested 3 attempts during trading sessions. Technically, FKLI were seen continue to ride on bull rally provided manage to trade above resistance levels at 1301 and 1312.5 regions; both were 78.6% and 100% Fibonacci resistance levels while support levels 1293 and 1289.5 must not be violated in order for bull rally to remain intact. CPO 3rd month Mac futures contract fall marginally RM4 points lower as compare to previous trading sessions to close at RM2626 with a total of 11,347 lots traded in the market. CPO price manage to rebound higher after fall for 3rd consecutive trading sessions as soybean oil was continue to trade lower despite crude oil was holding well against the selling pressure. CPO price seems manage to hold above 50% Fibonacci support levels at RM2604 regions after consolidate for almost 3 hours within range from RM2605 and RM2595 regions before manage to surge higher during 2nd trading sessions. Technically, CPO price would view remain intact with bullish sentiment provided support levels at RM2574 and RM2482; both were 61.8% and 100% Fibonacci support levels, were not violated during trading sessions. CPO price were expected to encounter certain degree of selling pressure around resistance levels at RM2673 and RM2700; both were 61.8% and 78.6% Fibonacci resistance levels.